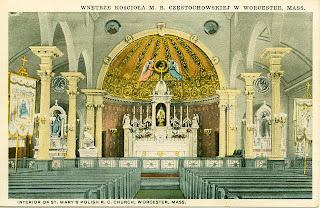 Our Lady of Czestochowa Parish, also known as St. Mary's, was founded in Worcester in 1903. 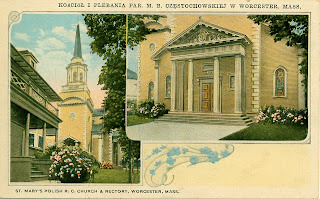 My Prokopowicz families have belonged to this parish for nearly a century, since their respective arrivals in Worcester. My parents and all their U.S.-born siblings were baptized here (nearly all by Rev. Boleslaw Bojanowski, pastor for about 40 years), as were many of my cousins and I. Many of our weddings and funerals have been held here as well. These postcards and photographs depict our beautiful church over the course of its first century. The church was built on Richland Street, a gracefully tree-lined street that ran uphill between Millbury and Vernon streets. Interstate 290 construction in 1959-60 altered this setting dramatically. Richland Street was truncated and cut off from Millbury by the highway, which runs so close to the church that priests complained to officials that heavy traffic was causing the stained-glass windows to vibrate. The rectory was moved from Richland to Ward Street, the original outdoor shrine was destroyed, and the graves of the first two pastors were transferred from the churchyard to Notre Dame Cemetery. The parish used the timing of the expressway project to its benefit in expanding the church to increase seating to 1,200 and build new meeting rooms and other facilities in the basement. Some of the exterior's original architectural detail was lost to modernization. A large new outdoor shrine was designed by then-pastor Monsignor Charles Chwalek, a man of considerable artistic talent. 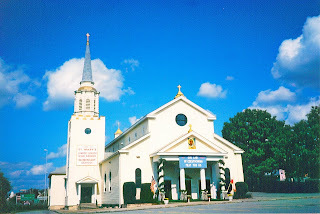 While many ethnic parishes have closed in the past few decades, Our Lady of Czestochowa has remained strong and vibrant. 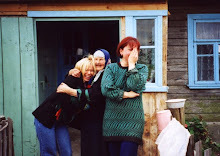 New generations of Polish immigrants have joined longtime member families in maintaining Polish traditions here, and English and Polish alternate as the languages in which Masses are held. The vintage postcards depict the church in its early years. The black-and-white photo, taken from behind the chain-link fence of Ward Street School, dates to about 1950. 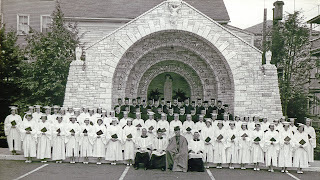 In the other black-and-white photo, the graduates of St. Mary's High School Class of 1964 and the parish priests pose before the new shrine. 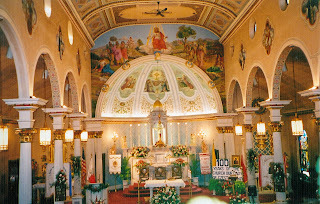 I took the color photos in 2003, during the parish centennial celebration. Visible in the lower left corner of the exterior shot is green signage for Interstate 290 Kelley Square Exit 13. On the right side, trees hide the parish rectory from view. The interior, shown from the choir loft, displays some banners of parish organizations, flags, and anniversary signs.